Hour-long sci-fi drama. Complete season watched for review. Reviews by Emily L. Stephens will run daily, beginning October 27. There’s an invasion descending upon Hawkins, Indiana, and it begins with the big, glowering figure intruding on Stranger Things’ beloved opening title sequence: That giant “2” flashing into view just before the Stephen King-biting typography locks into place. 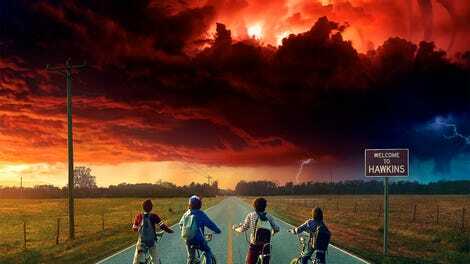 As Entertainment Weekly reported ahead of the supernatural Netflix thriller’s new installment, Stranger Things creators Matt and Ross Duffer “envisioned the return as not so much a second season but a movie sequel. To that end, when the show comes back it will have the cinematic moniker Stranger Things 2.” Never mind that this needlessly re-opens debates of primacy between TV or film, or that it re-inflames the inferiority complex underlining statements like “Game Of Thrones isn’t a TV show, it’s a 73-hour movie,” or that there’s precedent for this sequential naming convention in the likes of Prime Suspect or Blackadder. It’s obnoxious, but it fits: To follow up the sleeper hit of 2016, the Duffer brothers followed in the footsteps of other filmmakers attempting to top their own blockbusters. And so the second season of Stranger Things—or Stranger Things 2, if you must—goes bigger: a bigger threat to its sleepy Midwestern setting, a larger playing field, and an expanded roster of players that includes erstwhile Weyland-Yutani stooge Paul Reiser. It’s not going to convert skeptics who dismissed the first season for reconstituting VHS favorites for streaming audiences, but it gives the faithful more of what they liked the first time around, with greater stakes, a new batch of interdimensional nightmares, and a better sense for how Stranger Things can carry on for two (or maybe three) more rounds. We pick up less than a year after the events of the first season, in a Hawkins that has more or less reset following the disappearances of Will Byers (Noah Schnapp) and Barb Holland (Shannon Purser). 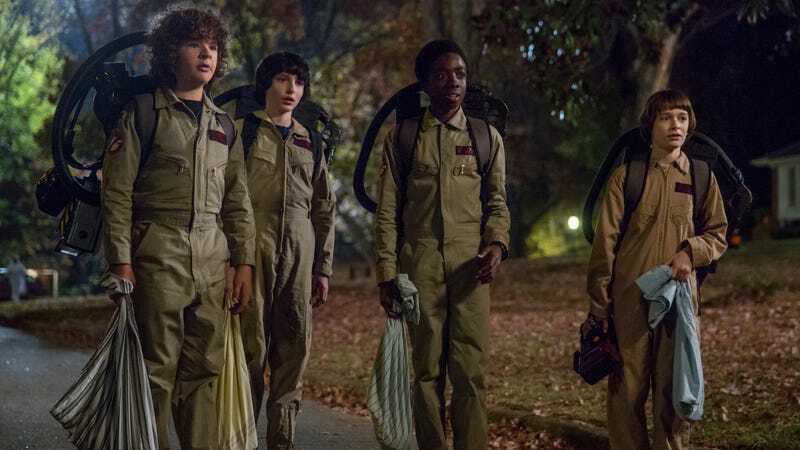 It’s October 1984, so Will, Mike (Finn Wolfhard), Dustin (Gaten Matarazzo), and Lucas (Caleb McLaughlin) are consumed with preserving high Dig Dug scores and perfecting their Ghostbusters Halloween costumes. But the fall of ’83 still weighs heavily on their minds. For Mike, that means vain attempts to contact the missing Eleven (Millie Bobby Brown); for Will, it means seeing doctors and seeing things—frightening flashes of the Upside Down and the creatures that dwell there. Rotting pumpkins and mysterious oozes kick off another investigation for police chief Jim Hopper (David Harbour), but the real intrigue in the early episodes is represented by a quartet of recent arrivals: new kids in town Max (Sadie Sink) and Billy (Dacre Montgomery), friendly Hawkins National Laboratory honcho Dr. Owens (Reiser), and dweeby Bob Newby (Sean Astin), manager of the local Radio Shack and current squeeze of Joyce Byers (Winona Ryder). Reiser’s casting is a sharp jab to the ribs for the genre fans, but the meta-sequel stuff is smarter and subtler beneath the characters’ surfaces, particularly in a spot that Stranger Things’ inspirations didn’t always treat with the greatest amount of care. Like Laurie Strode, Nancy Thompson, and Sarah Connor before them, they’ve lived through something no one around them could comprehend, let alone believe. Classmates taunt “zombie boy” Will, while Nancy (Natalia Dyer) and Steve (Joe Keery) grit their teeth through dinners with Barb’s parents—who, like their hashtag-happy counterparts in the real world, insist their daughter is still out there. (To that end, season two’s best addition is Murray Bauman, a kooky investigative journalist played to conspiracy-theorist perfection by Brett Gelman.) It’s here that Stranger Things uses its runtime to its advantage, digging into its characters in ways that make us more fearful for them as they wander deeper into the unknown. The recurrence of paranormal activity in Hawkins compounds their lingering states of shock, in ways that prove the Duffers are nothing if not expert manipulators of emotion. They get a leg up from the sincerity of their young cast and the peaks of Kyle Dixon and Michael Stein’s synthwave score, but the moments between the scares matter more than they did the first time around. It’s in Nancy’s survivor’s remorse or Jonathan’s (Charlie Heaton) brotherly responsibility, or everything Millie Bobby Brown pours into scenes from Eleven’s past. The Eleven of season two is steelier and more resilient, but she’s also still a kid, trying to make sense of the world she’s been shielded from and prone to telekinetic outbursts that put a fine point on the primal, two-way street of fear between children and parents. Such moments re-affirm Stranger Things’ ability to create indelible images, but it still waffles when stringing them together. Tension ratchets in a series of close calls in tight quarters, but inertia eventually sets in, as the season builds to its climactic confrontation and leaves some threads hanging to be picked up at a later date. Lumpy scripts keep the series from escaping the shadow of the video store, even in the hands of someone like WALL-E director Andrew Stanton, who helms season two’s liveliest passages. If recitation is to remain Stranger Things’ greatest strength, at least season two stays on theme by widening the show’s repertoire: In addition to the notes of Aliens that trail Reiser into the production, the Amblin homages open up—a dash of Gremlins here, some Jurassic Park there, and a season-finale team-up that makes up for the groaner of a Goonies allusion Astin delivers a few episodes prior. Most surprising (and entertaining) of all, a detour with Dyer and Heaton blooms into a Doris Day-Rock Hudson screwball romp. It’s sequences like this that prove that Stranger Things is more than an empty Halloween costume, because they take root in a firm foundation of character (something season two accidentally proves with a supremely silly stand-alone episode full of flimsy caricatures and uncharacteristically weak performances). Season two makes a stab at some “power of storytelling” material, but it’s more than the show can really pull off. Stranger Things is a confection, a feeling, a memory, one with a growing canon of its own nostalgic triggers: the bloody noses, the Upside Down’s wispy environmental flotsam, the analog burble of Dixon and Stein’s “Kids.” It’s the joy and terror of growing up, blown up to town-swallowing size. At a base level, movie studios make sequels because movie studios like making money. But people go to see sequels because they want to return to the world built by the preceding movie, to spend time with the characters who live there. But getting to go back again and again—to watch as characters and relationships grow and change, affecting the story in unexpected fashion—has always been part of television’s allure (something reflected in the increasingly TV-like feel of major motion-picture franchises). So, in that respect, sure: Go ahead and call it Stranger Things 2. But it’s also the second season of Stranger Things, nine more episodes of a surprise phenomenon that might be uneven, but still has plenty of power up its sleeve.